Whether it's an article on the front page of an industry magazine or a Thursday-afternoon Colloquium lecture by one of the top minds in optics, the news and events of the College of Optical Sciences keep information in motion in the Meinel Building. 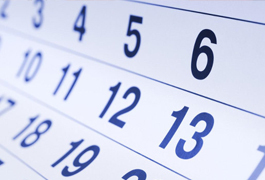 If you have a news item to report or an event to list in the OSC calendar, please contact info@optics.arizona.edu. OSC's primary source of information is our biweekly newsletter, Watts Up! But you can also explore all things UA Optics through our press releases, feature articles, media mentions and quicknews. A lively forum wherein academic scholars and industry leaders discuss groundbreaking research and encourage questions and comments. Held on Thursdays during the academic year, the forum is open to students, faculty, the optics community and the general public. 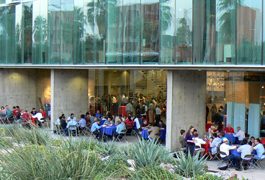 View a month-by-month overview of UA and OSC events, including those for alumni, colloquiums, workshops, presentations and other industry related events. We make an effort to document every significant event that occurs at the College of Optical Sciences. Peruse events going back to 2003 in our photo gallery section. 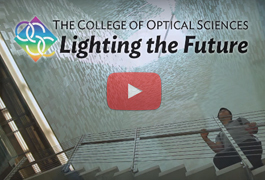 The College of Optical Sciences, its faculty and students and events and presentations have been featured in numerous videos ranging from local news pieces to associated YouTube channels. 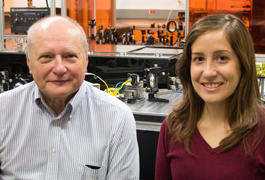 The University of Arizona College of Optical Sciences will hold its ninth annual Laser Fun Day as SOCk, the official undergraduate and graduate student optics organization, brings the science of optics alive for all ages. The educational extravaganza takes place on Saturday, April 20 from 10 a.m. to 3 p.m. in the Meinel Building, 1630 E. University Blvd. on the UA campus. Admission is free and open to the public. This year Laser Fun Day will be hosting numerous optical science demonstrations from cow eye dissections, IR cameras, to interactive demos and our overwhelmingly popular laser maze. 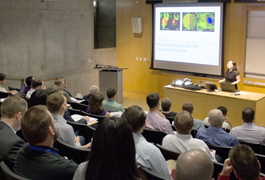 Featured topics are colors, lasers, and high tech applications of optics. This Laser Fun Day is made possible through grants from the International Society for Optics and Photonics (SPIE) and The Optical Society (OSA), as well as a generous donation from BAE Systems. Additionally, Laser Fun Day could not happen without the countless hours of student volunteers. RSVP to the event on Facebook. About the Student Optics Chapter: SOCk, the University of Arizona Student Optics Chapter, promotes the disciplines of math and science, especially optical sciences and optical engineering. Established in 2004, it is affiliated with OSA and SPIE, two of the most respected professional societies in the field of optics.